Last Thursday night 160+ donors and community members gathered in the Old Boys School Fremantle to hear 4x incredible pitches from our Impact100 Fremantle finalists. Impact100 Fremantle inspires at least 100 donors to each contribute $1,000 annually and then pool the contributions to make high impact grants to local charities and projects. This year Black Swan Health, Fremantle Men’s Community Shed, Fremantle PCYC and ICEA Foundation raised the bar with their pitches in an effort to win the game changing $100,000 grant. Fremantle PCYC were the recipients of the major $100,000 grant which will allow them to run a Breakfast Club for vulnerable and at-risk children in Fremantle for the next two years. Breakfast Club will provide breakfast for 30+ children aged 5 to 12 years every Monday and Wednesday morning during school terms in 2019 and 2020. Children will arrive by 7.30 and have a healthy breakfast following exercise or targeted activities, and then be walked to school. Overall, the program aims to improve the food security and nutrition of children living in disadvantage and providing them an equal opportunity to excel academically, emotionally and socially. Congratulations to Julie Gorman, Daniel Roy and the team at Fremantle PCYC! Thanks to the generosity of our Impact100 Fremantle donors we raised a total of $115,000 allowing our three deserving finalists Black Swan Health, Fremantle Men’s Community Shed and ICEA Foundation to each receive a $5,000 grant. Impact100 Fremantle is only possible because of the generosity of our donors. 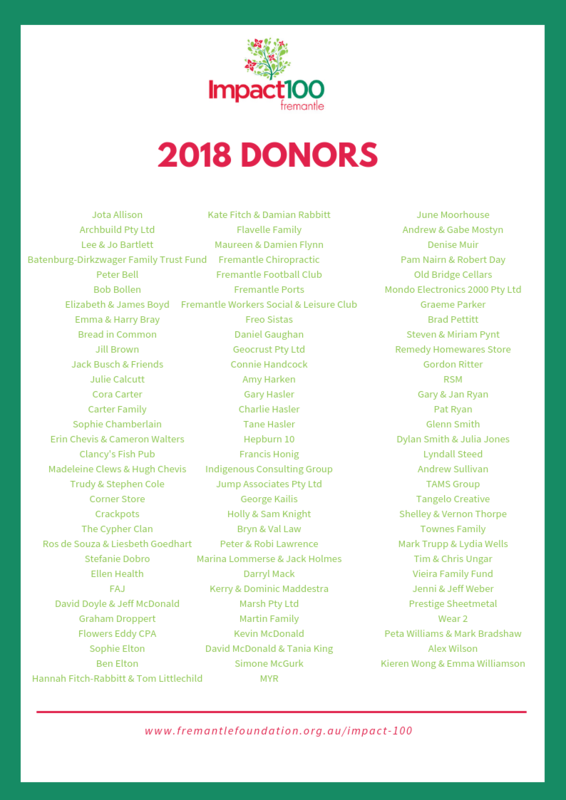 Be part of the Impact100 Fremantle donor community in 2019! Give $1,000 and make a $100,000 difference in your community. 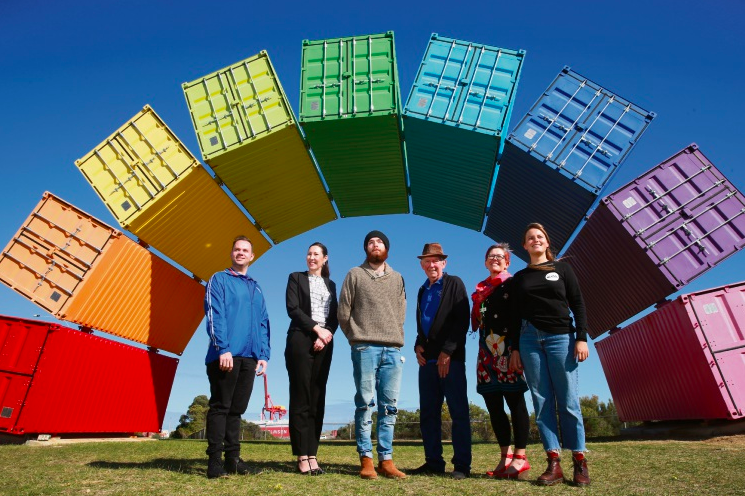 If you would like to give to Impact100 Fremantle 2019 as part of a group or workplace please contact our Social Impact Manager, Hannah Fitch-Rabbitt, who can assist you to make this easy for each member of your group to give. Want to continue supporting our Finalists? Black Swan Health welcomes all support from the Fremantle community and from the Impact 100 Fremantle donors. Freo Street Doctor clinics are delivered daily within City of Fremantle. Black Swan Health actively seek volunteers for the Freo Street Doctor service. Volunteers support the sustainability of the service and allow the organisation to expand the reach of Freo Street Doctor to more people in need of health care. Volunteering with Freo Street Doctor provides the opportunity to experience and contribute to the sense of community that is welcomed by our clients. The opportunity to have a conversation with people at Freo Street Doctor clinics is welcomed by clients who often find it hard to engage with people in other locations. Freo Street Doctor is generously supported with donations of items that are shared with our clients such as blankets and hand-knitted winter items, swags and bedding, toiletries and personal care items.Black Swan Health welcome all donations of these items which enables us to enrich our clients lives by just knowing someone has thought about their wellbeing. Black Swan Health welcomes all financial support for Freo Street Doctor. We undertake all opportunities to maintain a financially viable service and all donations support additional clinic sessions. Each donation of $500 will support expenses associated with a Freo Street Doctor clinic including salary for the Outreach Worker and GP, vehicle running costs and medical supplies used in the provision of health care. For more information about Freo Street Doctor and their contact details CLICK HERE. Join the Fremantle Men’s Community Shed and become a Member! Membership forms are available online here. Do you have expertise you feel may be of value to the Fremantle Men’s Community Shed?! Skilled volunteers are always welcomed and valued. $1,000; Funds would be utilised by professionally producing an e-booklet providing individuals and support organisations for persons in our target groups. For more information about Fremantle Men’s Community Shed and their contact details CLICK HERE. PCYC absolutely depends on the efforts of volunteers. Fremantle PCYC currently need people to drive the bus to drop kids off at home after the PCYC closes. Volunteers also lend a hand supervising the Safe Space program and the Breakfast Club and other programs with an attendant youth worker. Donors would be made to feel most welcome should they wish to volunteer their time in a hands on capacity or they may contribute in other ways such as collecting needed donations such as food and donations or they may have other skills that could be put to good use. Working with disadvantaged young people has its challenges, but in the end, when you see the impact that just small interventions have with these children, it makes it all worthwhile! The Fremantle PCYC has been fortunate to receive small amounts of monies to commence some of our youth diversionary programs, designed to attract and engage with different segments of Fremantle’s young people. For example, Safe Sistas is a spin on the Safe Space program which is aimed at young women specifically, bringing them together for one night a week to learn personal development in an environment that is supportive and safe, without judgement or distractions. It’s a place the girls feel safe, hang with friends, get away from their troubles at home and learn some valuable life skills such as resume writing, cooking and personal development. Another project which has been funded through small grants which is currently running is the Gnarniny Program at Hilton Harvest Community Garden – a food-based program where participants grow, harvest and then prepare their own food – they learn lessons in nutrition, taking care of things and working with others. These are just two of the many projects we could not have delivered if not for the generous donations previously received. Additional donations are able to support further youth diversionary programs. For more information about Fremantle PCYC and their contact details CLICK HERE. A vital step in moving forward towards reconciliation is to ensure all Australians know about Australia’s shared history, Australia’s First Peoples and the world’s oldest surviving culture. Yarn is a youth-to-youth program that facilitates an understanding of cultural identity, shared history and reconciliation. Book a Yarn with ICEA for your business, community or local school. Traditionally 10 years of marriage is rewarded with tin, suppose that means it’s time for ICEA to start rattling tins. After 10 years of learning, growing, and evolving ICEA couldn’t be more proud of what they have achieved in the last 10 years. To allow the growth to continue ICEA are turning to the community who have always been an integral part of the ICEA Family. For $10 a month you can empower other Australians to get on board and we can shift the Australian story together. Find 50 is a collective fundraising initiative building a community of like-minded donors who are passionate about supporting ICEA’s mission of moving towards reconciliation. Support ICEA in the delivery of its key programs: the annual ICEA Classic, our Yarn reconciliation workshops, and the Remote Communities Leadership program. Be able to attend Find 50 events where you can connect with like-minded members of the Find 50 community. For more information about ICEA Foundation and their contact details CLICK HERE. How big is the Fremantle Foundation? What geographic area does the Fremantle Foundation support?